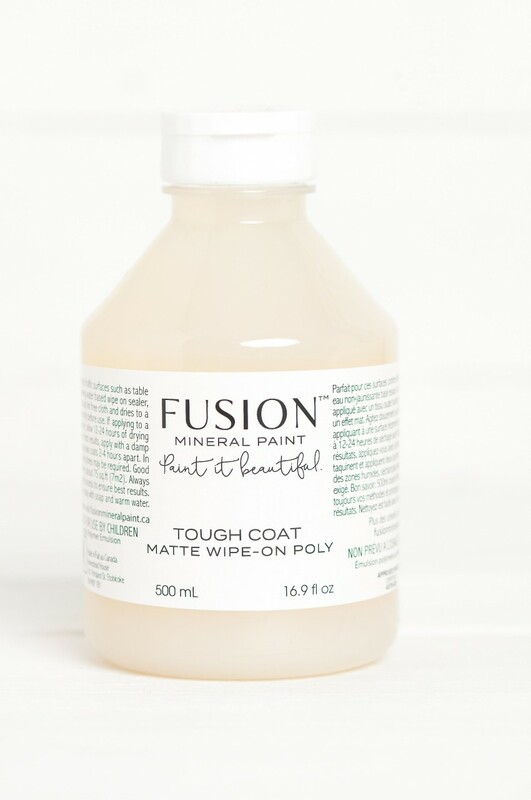 Fusion™ Mineral Paint is famous for its built in top coat. The 100% acrylic resin acts as the “glue”, so to speak, and results in the best adhesion, and long-term durability against wear and tear. It is a waterproof, non-porous surface which is why you don’t need a top coat. Sometimes though, you may want a slight sheen and added colour vibrancy, or you may want the peace of mind of an extra bit of protection over high traffic areas such as kitchen cabinets or table tops. This is where our Tough Coat™ comes into play! Tough Coat™ uses only 100% acrylic resin and is perfect as a top coat sealer for those high traffic surfaces such as table tops, seating, doors and dries to a matte finish. 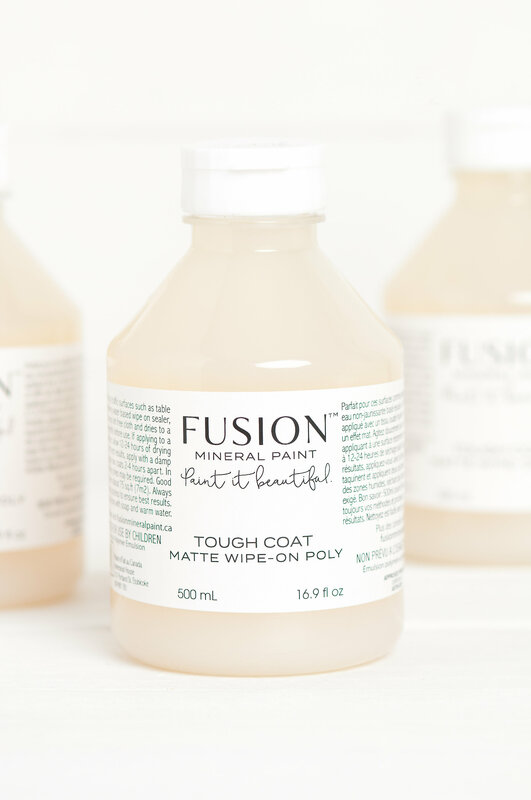 Fusion™ Tough Coat™ differs from our competition with its use of pure non yellowing acrylic. Normally other products on the market are using lesser acrylic resins which will yellow and embrittle over time, not binding as well therefore leaving a less durable finish. We have done extensive testing to ensure that we are offering you the best of the best. The following image shows how Fusion™’s Tough Coat™ up to 3 years of UV exposure in comparison to a competitor brand. As you can see, the Fusion™ Tough Coat™ maintains its clear transparency while the competitor brand yellowed. The keys to applying Tough Coat™ to your projects are: Use sparingly and work quickly as it dries fast! When applying, do not pass over the same area more than 2-3 times. We recommend using a fine microfiber applicator like our applicator pads for a smooth consistent finish. If applying to a recently painted surface, allow the surface to dry for 12 hours before applying. For maximum durability, apply two coats waiting 2-4 hours between applications. In humid areas, longer drying times may be required. Tip: When applied to darker colours, imperfections may be more noticeable. It is best to sand down any imperfections between coats to acquire that flawless finish. Be sure to gently mix your Tough Coat™ by gently rolling it around prior to using it as the matting agent and other ingredients may settle to the bottom. Do not shake vigorously as this will cause air bubbles in your piece that are difficult to remove once applied. If bubbles begin to occur on your piece, simply remove excess Tough Coat™ from your brush and gently brush out the bubbles. 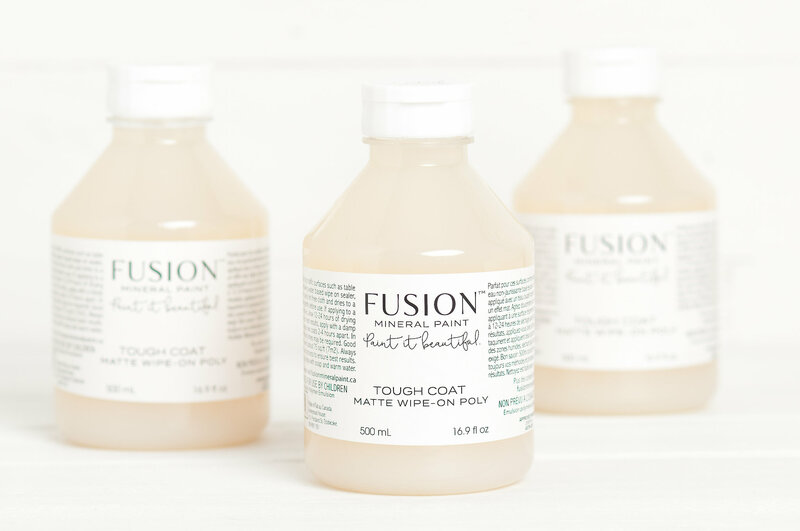 Tough Coat™ will begin to dry as you’re using it. In order to avoid brush strokes, try not to spend too much time on one spot and do not back brush (usually no longer than 30 seconds).